Administrators are users that have more functionalities and user rights, here is how you give more users the admin rights. 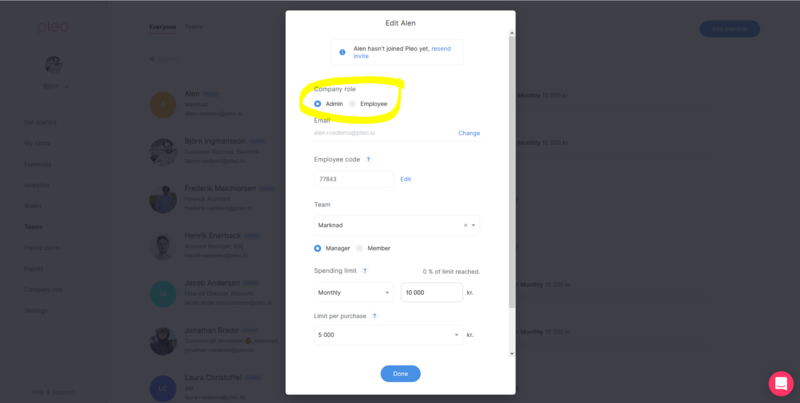 Administrators are by default users who sign up their company on Pleo and have the possibilities to invite other team members, order plastic cards and transfer funds to the Pleo Account. This opens a pop-up where you administrate the accounts. The first setting is the company role. If you wish to set this user as admin, simply choose "Admin"